TRAVEL ADVENTURES . . .
Local Santa Barbara travel, food, lifestyle writers Bonnie Carroll (who was also a judge for the 2017 competition), Michael Cervin and Richard Mineards were among the panel of nine jury judges to select the winners for the Gelato Fesitval America Santa Barbara winners. Judging was based on presentation, flavor, structure and creativity. Competitors were introduced prior to the judging to share details on their entree and answer questions. Additional writers included Mark Longo, Annette Moore, Jeanne Fialello, Currie Mitchel, Amber Wilson and Christina Conte. 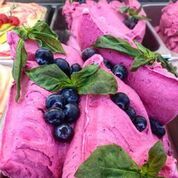 Blueberry Basil, Mike Guerriero of Gelotti Essex in Caldwell, New Jersey; Second Place: La Dolce Vita by Filippo Cianciosi, Gelato Love in Carlsbad, California; Third Place: The SoCal Sunrise by Savannah G. Lee, Fiasco Gelato in Millbrae, California. Daniele Palazzoni, Gelato Festival America Director was Emcee and assisted with award presentations. Now in its second year, Gelato Festival America celebrated their second Santa Barbara edition this weekend at La Cumbre Plaza. The mission of Gelato Festival America is to spread the culture of artisanal Italian gelato throughout the United States by their visits to seven cities this summer. Mike Guerriero from Gelotti Essex in Caldwell, New Jersey won 1st place and is the first American to take first prize at Gelato Festival. Other prizewinners included three residents of California: Noel Knecht of Black Dog Gelato in San Clemente, Savannah G. Lee of Savannah’s Gelato Kitchen in Millbrae and Filippo Cianciosi of Gelato Love in Carlsbad. An honorary mention and peoples choice award was given to Marilyn Way, a resident of Calgary, Alberta, Canada. Mike Guerriero is the first American to win this prize and he is now eligible to compete in the North American Semi-Finals in 2019 for a chance to be one of three to represent America at the Gelato Festival World Masters in 2021 in Italy. His gold medal, presented by ISA, was created by Florentine Goldsmith Paolo Penko. “Guerriero said he was very excited to win the 1st place gold medal and looked forward to competing again to make it to Italy in 2021.” This New Jersey blueberry, with the perfect amount of genovese basil puree and lemon juice was my favorite and was one delicious gelato! The Technical Jury prize was awarded to Noel Knecht, Black Dog Gelato in San Clemente, CA and the Popular Jury Award was presented to Marilyn Way of Calgary, Alberta, Canada by the general public for best flavor and she also picked up the Speed Cup Race by ISA for using a spatula quickly to fill cups the Italian way. I loved the clean and simple taste of this delicious gelato. Carpigiani Gelato University, the festival sponsor that runs classes about the art of preparing gelato for all the stages, presented this award. The kids jury selected Savannah G. Lee's gelato a special mention. Mike Guerriero won the Gela-to-go Award for selling the most gelato during the festival. Held in collaboration with strategic partners Carpigiani Gelato University, Carpigiani Frozen Dessert University and Sigep - Italian Exhibition Group, Main Sponsor PreGel and WhyGelato.com, and Official Technical Sponsor ISA, the Gelato Festival America 2018 generates the first entrants into the Gelato Festival World Masters 2021, the challenge for the best artisan gelato chefs on the planet. The winning gelato chefs selected at each stage of the Gelato Festival America 2018 will win the right to continue the challenge towards the semi-finals and ultimately the final – it’s the World Cup of gelato, a journey with hundreds of trials over four years on five continents! The Gelato Festival made its debut in Florence in 2010 inspired by the idea of ​the first gelato recipe by the architect Bernardo Buontalenti in 1559. Since then, the Gelato Festival has expanded its borders, beginning in Italy, then spreading throughout Europe and finally to the United States in 2017 - A total of 64 festivals, preparing the whole planet for the world championship of the Gelato Festival World Masters 2021. For upcoming event information visit www.gelatofestivalamerica.com. It was chowder on at the Santa Barbara Maritime Museum, first time host for the delicious annual Chowder Fest event, where attendees tasted and voted on the best chowder for the people's choice award. The Annual event is presented each year by Food & Home Magazine to benefit Legal Aid Foundation of Santa Barbara County. Jennifer R. Smith, Executive Director of Legal Aid Foundation was graciously greeting guests as they arrived, and I enjoyed speaking with Greg Gorga, Executive Director of the Santa Barbara Maritime Museum during the event. The patio of the Maritime Museum was one fun filled venue where guests enjoyed the musical entertainment of Spencer and the Gardner while sipping wine and chowder between visits to the elegant silent auction area where an impressive collection of auction items were open for bidding, including a chance to attend Rod Stewart's concert at the Santa Barbara Bowl. My favorite auction items included a box of Chocolate du Cali Bressan with a fine rose wine, and a weekend in Las Vegas. The museum was over flowing with charitable supporters, LAFSBC members, local guests and enthusiastic 'foodies' all enjoying gourmet and down-home style chowders. A few welcome change was the Shepherd's Pie Paul Dargan brought over from Dargan's Irish Pub and amazing street style Mexican food by Taqueria El Pastorcito for guest consumption, as well as individual strawberry shortcakes from Andersen's Danish Bakery & Restaurant. The variety of food and wine at this event was absolutely awe inspiring. 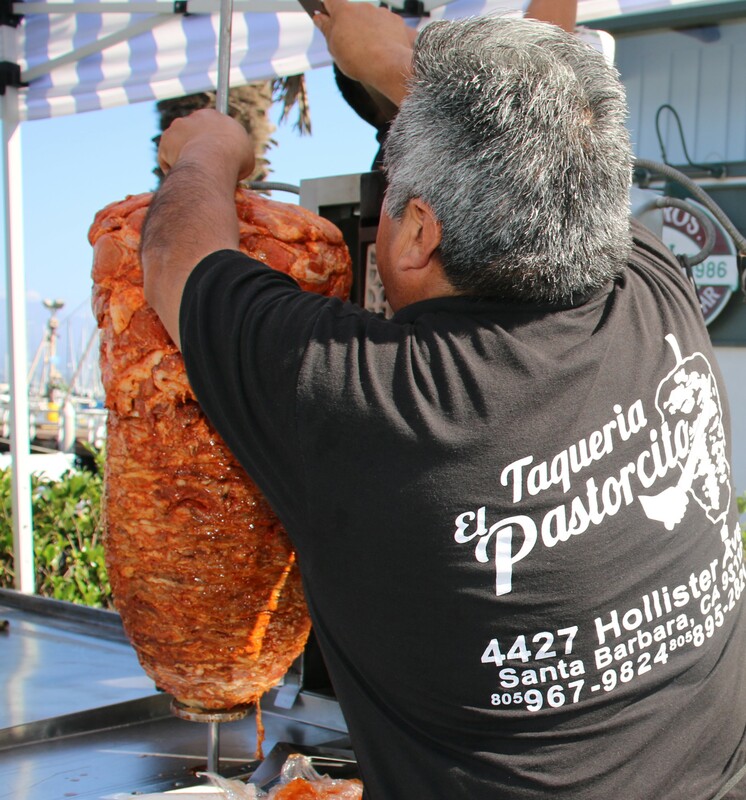 2018 Winners: The Best Chowder First Place Award went to Paul & Kathy Shield of Savoy Cafe & Deli, while Estaban Carrillo and Charlie Rios of Crocodile Restaurant won the People's Choice Award and also were the 1st runner up for Judges Choice. The 2018 Contenders included Bluewater Grill, Chase Restaurant & Bar, Chef Alison Catering, Chumash Casino, Crocodile, Crush, Enterprise Fish Co, The Nugget, The Oyster Tin, Savoy Deli, The Secret Ingredient/Cafe154 and Whole Foods. Past Chowder Fest best winners include The Boathouse, Y's Foods, Outback Steakhouse, Chuck's Waterfront Grill, Three Pickles, Four Seasons Biltmore, and The Nugget. A special tribute honoring Bob Lovejoy owner of Three Pickles Restaurant and 2017 Chowder Fest winner, who passed away this year, as well as Allan Ghitterman, Board Member of Legal Aid, who also passed away in 2018 appeared in the event program. 2018 Judges for the event included Chef Edie Robertson, former chef/co-owner of the Sojourner Cafe, and recognized as one of Santa Barbara's best private chefs by Santa Barbara Magazine; Diana Cuttrell, Executive Chef/Owner at Dining With Di, the daughter of the owners of a successful steak house in Northern California she founded a catering company in Santa Barbara in 2009; Mark ad Margaret Huston, Owners of Jane Restaurant who met at the Culinary Academy in San Francisco, have a stellar career history in restaurant and food including work at San Ysidro Ranch and the Montecito Cafe, along with their current venues in Santa Barbara and Goleta known for delicious food, made from scratch at affordable prices; Kaity Swanson, Manager of Chuck's Waterfront Grill & The Endless Summer bar-cafe has been with them for twelve years, and took home the “Best Chowder” award in 2013. Restaurants, wineries and breweries participating this year included Andersen's Danish Bakery & Restaurant, The Brander Vineyard, The Brewhouse, Buttonwood Farm Winery & Vineyard, California Wood Fired Catering, The Creekside Restaurant & Bar, Dargan's Irish Pub & Restaurant, Deux Bakery, Figueroa Mountain Brewing, Grassini Family Vineyards, Island Brewing Company, Kanoloa Seafood, Lucas & Lewellen Vineyards, Oreana Winery, Pali Wine Company, Savoy Wines, Seagrape Wine Company, Stolpman Vineyards, Taqueria El Pastorcito, Telegraph Brewing Company, Temperance Cellars, Via Maestra 42, Whitcraft Winery. Event sponsors included the Title Sponsors Fell, Marking, Abkin, Montgomery, Granet & Raney, LLP and Santa Barbara County Bar Association. Lobster Chowder Circle sponsors Santa Ynez Band of Chumash Indians, Clam Chowder Circle Sponsors Cappello & Noel LLP, Community West Bank, Foley, Bezek, Behle & Curtis LLP, Gursey Schneider LLP Reicker, Pfau, Pyle & McRoy LLP and Fish Chowder Circle Sponsors Ambrecht and McDermott LLP, Renee Fairbanks, Kelly Knight Real Estate, Bill and Susan Wagner, Wilson & Petine, LLC, and Vegetable Chowder Circle Sponsors American Riviera Bank, Alan and Carol Blakeboro, William L. F. Felstiner, Griffith and Thornburgh, LLP, Mission Wealth Management, Montecito Bank and Trust, Mulle and Henzell, Price, Postel & Parma LLP, Village Properties. Corn Chowder Circle Sponsors Anticouni and Associates, Bongiovi Mediation, Collins and Associates, Drury Pullen, A Prof. Law Corp., Ghitterman, Ghitterman & Feld, Saji Gunawardane, US Business Counsel, Hebda Property and Title Solutions, Herring Law Group, Law Office of Harvey Wolf, Law Offices of Elizabeth E. Vogt, Law Offices of Moises Vasques, Montecito apital Management, Nicholson and Schwartz CPAs, Nordstrand Black, Plverman & Pulverman, LLP, Quinn Fiduciary Services, Judge Elinor Reiner, Rothschild and Alwill APC, Sierra Property Group, Thompson Naylor Architects. About Legal Aid Foundation of Santa Barbara County: Legal Aid Foundation of Santa Barbara County has been providing free legal services since 1959. Many people are unaware that when factoring in cost of living, Santa Barbara County's poverty rate is estimated to be 23% of all residents. Our vision is to ensure that everyone, regardless of their financial status, has habitable shelter, adequate income, and protection from domestic violence, sexual assault, and elder abuse. Our attorneys and staff are trained to work with people who have little knowledge of our legal system, people with mental or physical disabilities, and people who speak languages other than English. For information visit www.lafsbc.org. Celebrate a week long series of promotional events embracing Italian traditions and authentic foods paired with unparalleled wines. The program will spotlight a selection of leading Italian restaurants in the West Coast presenting a traditional menu centered on the region of Puglia. Participating restaurants will be serving clients a fixed price menu or feature a special dish offered exclusively during that week. Inquire about the "World Week of Italian Cuisine" Menu upon arrival. Reservations may be required for selected restaurants which could be made directly through the restaurants.